Budget Secretary Rolando Andaya bares today (June 12) the release of funds of the national wealth from minerals and forestry resources amounting to Php262 Million throughout Caraga Region. 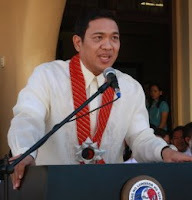 In his speech during the 110th Independence Celebration in Surigao City, Sec. Andaya enumerated the following mineral share for the provincial gov't of Surigao del Norte amounted to 30 Million, for Claver 31.8 Million, Surigao City government will receive 35.9 Million. "Seven barangays will share the balance, Brgy. Taganito in Claver 23.2 Million, Talisay 10.3 Million, San Pedro 3.9 Million, Nonoc 7.2 Million, Cantiasay 6.3 Million all in Surigao City," Andaya added. For the province of Dinagat Islands the provincial government according to Andaya will get P8.5 Million, Cagdianao P17.3 Million and in one barangay in Cagdianao, Brgy. Valencia is set to receive P13.4 Million. "For the forestry, the dividend of the region is P54.8 Million to be shared by two provinces Surigao del Sur P42.3 Million and in Agusan del Sur P12.4 Million." On top of this, Sec. Andaya also said the President has approved the release of P5 Million for the construction of a water system in San Isidro, Surigao del Norte, P5 Million for the construction of a road connecting Brgy. Sering to Brgy. Atuyay in Socorro, Surigao del Norte, P1.2 Million for the construction of a school building in Tubod District Elementary School, P1.2 Million for the construction of a school building in Sison Elementary School, 1.5 Million for a new school building in Surigao City Elementary School, 650,000 for a classroom in Bacuag Elementary School, Placer Elementary School, Malimono Elementary School. 500,000 for classroom in Alegria National High School and San Francisco Elementary School and P1.5 Million for a new ward in Caraga Regional Hospital. "For Surigao City we have also earmarked 10 Million pesos for various health, education, infrastructure projects… we are also releasing the initial mobilization fund in the amount of P10 Million for the reconstruction of Banban Bridge in Tagana-an, Surigao del Norte. The rehabilitation of Union-Malinao road in Gen. Luna and the Mansayao, Cabuyawan, Pili, Cantapoy road in Malimono," Andaya added. Additional assistance will also be received by the Dinagatnons for the construction of farm to market road in Basilisa town amounted to 10 Million as requested by Dinagat Islands Gov. Jade Ecleo.